Line a large baking sheet with parchment paper. Place chocolate chips in a large microwave-safe bowl. Microwave uncovered for 2-3 minutes. Stir, and continue heating in short intervals until chocolate is smooth and glossy when you stir it. Pour chocolate out onto parchment and use a large rubber spatula to spread in a thin, even layer (about 1/4 inch thick). 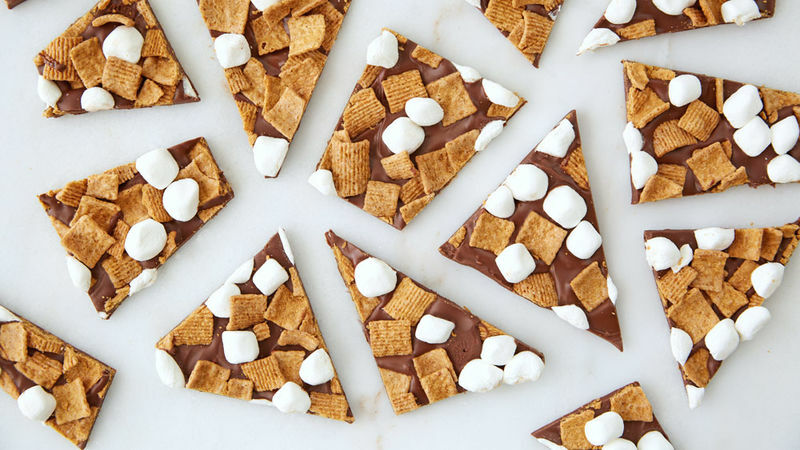 Immediately sprinkle cereal and marshmallows over chocolate. Let stand about 30 minutes or until firm, or refrigerate if necessary. Break into 2-inch pieces. Store covered at room temperature. Parchment paper works best for this recipe, but you can also use wax paper or foil in a pinch.